This image released by Disney-Marvel Studios shows Brie Larson in a scene from "Captain Marvel." The online trolling was fierce. Brie Larson, Oscar-winning star of the upcoming “Captain Marvel,” is too political, the trolls said. She can’t possibly be strong enough. She’s forcing diversity on moviegoers. Perhaps worst of all, she doesn’t smile enough, the trolls whined. So they posted doctored pictures of Larson, in her Captain Marvel regalia, doing what superheroes-male, female or otherwise-seldom do while rescuing Earth from almost certain annihilation. Smiling. But besieged movie studios have learned how to deal with online turmoil. With hundreds of millions of dollars on the line, the Walt Disney Co. empire-and Larson herself-struck back. She shared altered photos of other Marvel superheroes, the male Iron Man, the male Captain America and the male Doctor Strange, with silly grins to illustrate the double standard of the “smile more” trope. She also countered another line of attack. 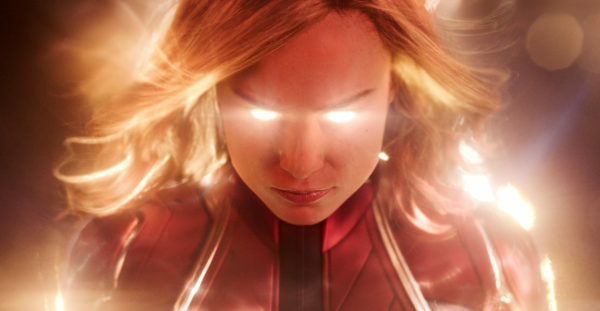 The comic-book Captain Marvel has been a man and a woman over the years (unlike, say, Wonder Woman), and Larson faced questions over whether she was brawny enough to play one of the most powerful characters in the Marvel universe. In a show of strength, she posted videos of her workouts on Instagram, including one where she pushed a 5,000-pound Jeep. Larson also didn’t shy away from the topic of female empowerment in interviews. Not that long ago, a studio trying something different-remaking a classic comedy with women in the lead roles instead of men, say, or casting a female Asian-American as a day-saving fighter pilot-struggled with how to respond to online harassment campaigns. That wounded Sony Pictures’ 2016 “Ghostbusters” reboot, and it drove Kelly Marie Tran of Disney’s “Star Wars: The Last Jedi” off Instagram. “The Last Jedi,” boosted by moviegoer loyalty to its beloved franchise, did well at the box office. But “Ghostbusters” struggled, despite mostly positive reviews and an opening weekend that was a career best dollarwise for director Paul Feig and actress Melissa McCarthy. Along the way, actress-comedian Leslie Jones was subjected to online racism and misogyny, similar to what bedeviled Tran. “Captain Marvel,” which comes out this week, is set in the 1990s, when alter ego Carol Danvers becomes one of the universe’s most powerful heroes and joins a galactic war between two alien races. The film could garner opening-weekend ticket sales of about $125 million in theaters in the U.S. and Canada, rivaling (male) Marvel colleagues Iron Man and Thor. Shawn Robbins, chief analyst at the research site Box Office Pro, put his estimate at $160 million. Trolls seem hellbent on driving those numbers down. They’re a relatively recent phenomenon, a loose organization of men dedicated to policing the culture. Having achieved success using social media to hound female gamers and journalists during the so-called Gamergate of the earlier 2010s, they moved on to politics and now cinema.The attacks have gotten so bad that Rotten Tomatoes took the step last week of prohibiting reviews before a movie’s release, an attempt to prevent trolls from torpedoing a film. Disney has plenty of experience dealing with the onslaught. Executives and strategists try to keep their tactics under the radar, and Disney declined to provide an executive to comment on its tactics. But the studio’s answer to the online hate is there for all to see on the internet. Last year, trolls zeroed in on “Black Panther” and its groundbreaking African-American cast. Facebook groups tried to target the Rotten Tomatoes scores of the movie, posting negative comments to depress the online index that some moviegoers use to gauge whether the film is worth seeing. Facebook took the pages down, while Twitter tackled fake reports of racially motivated violence at screenings. The movie went on to become the highest-grossing superhero movie ever screened in U.S. and Canadian theaters. Some digital-marketing specialists recommend leaving it to the fans of the movies to correct any negative discourse, rather than having the companies intervene. But studios have made countering online barrages a priority. In 2019, digital ad spending in the entertainment industry will be an estimated $6.64 billion, up from $3.45 billion in 2016, according to researcher EMarketer. Spending on digital has risen from a maximum of 10 percent of the overall marketing budget to, in some cases, half the funds for a movie campaign, Pertschuk said. Likewise, the number of teams at the major Hollywood studios dedicated to countering online trolling has swollen from just a handful to as many as 40, said Marc Karzen, lead strategist at RelishMix, which tracks online activity and advises studios on tactics.